As the summer warmth beckons us to the beach and poolside, outside activities mean more exposure to the sun. That means exposure to ultraviolet radiation and risk of skin cancer. What’s important is to protect your family from exposure to UVA and UVB, the rays that cause skin damage. UV rays react with a chemical called melanin that’s found in most people’s skin. Melanin is your first defense against the sun. It absorbs dangerous UV rays before they do serious skin damage. Melanin is found in different concentrations and colors, resulting in different skin colors. The lighter your child’s natural skin color, the less melanin it has to absorb UV and protect itself. The darker your child’s natural skin color, the more melanin it has to protect itself. (But both dark- and light-skinned kids need protection from UV rays because any tanning or burning causes skin damage.) Also, people, especially kids,with fair complexions—lighter skin and eye color—are more likely to have freckles because there’s less melanin in their skin. Although freckles are harmless, being outside in the sun may help cause them or make them darker. As the melanin increases in response to sun exposure, the skin tans. But even that “healthy” tan may be a sign of sun damage. The risk of damage increases with the amount and intensity of exposure. Those who are chronically exposed to the sun, such as farmers, boaters, and sunbathers, are at much greater risk. A sunburn develops when the amount of UV exposure is greater than what can be protected against by the skin’s melanin. Experts say that one blistering sunburn in childhood more than doubles a person’s chances of developing melanoma later in life. Ready for some good news? The survival rate for patients with early detection is about 99%. The survival rate falls to between 15 and 65% or higher, depending on how far the disease has spread before detected. Your skin type, which depends on the amount of natural protection your skin provides you, is a key factor when determining your risk of developing skin cancer. There are six types of skin phototypes, going from light to dark. The highest risk is for those with skin types I and II, while types V and VI are at the lowest risk. More skin pigmentation results in more natural protection from the sun. However, people with dark skin can nonetheless get skin cancer and still need to be cautious. Skin type isn’t the only thing to consider when determining skin cancer risk. Family history, childhood sun exposure, personal skin cancer history, and other factors all play a part in determining your overall risk. If you’re not familiar with your family’s medical history, consider contacting family members to find out if there is a history of melanoma in your family tree. We are all at risk for melanoma. However, some people are more at risk than others. Heredity plays a major role. If your mother, father, siblings, or children (first-degree relatives) have had a melanoma, you are part of a melanoma-prone family. Each person with a first-degree relative diagnosed with melanoma has a 50 percent greater chance of developing the disease than members of the general public who do not have a family history of the disease. If the cancer occurred in a grandmother, grandfather, aunt, uncle, niece, or nephew (second-degree relatives), there is still an increase in risk compared to the general population, though it is not as great. About one of every ten patients diagnosed with the disease has a family member with a history of melanoma. If melanoma is present in your family, you can protect yourself and your children by being particularly vigilant in watching for the early warning signs and finding the cancer when it is easiest to treat. When this skin cancer is diagnosed, it is standard practice for physicians to recommend that close relatives be examined immediately for melanoma and for the presence of unusual or atypical moles. These moles are also called “dysplastic nevi.” You can read more about atypical moles here. A mutation (alteration) in a recently discovered gene, the BRAF, may play a part in causing melanoma. In one study, this mutated gene was found in two-thirds of the melanoma cells analyzed. BRAF is called a “switch” gene, because it turns on to allow the cells to grow and divide. Mutations in this gene can lead to uncontrolled cell growth and cancer. The discovery is an exciting research breakthrough, but physicians and patients are still years away from reaping the rewards. Ultimately, the understanding of the BRAF gene could lead to the development of diagnostic tools and drug therapies. The mutations most commonly seen in familial melanoma occur in another gene, p53. When this gene is in its normal state, its main function is to give damaged cells time to repair themselves and not progress to cancer. However, when the gene is altered, it becomes unable to perform this function, and cancer can result. A number of gene mutations in addition to p53 and BRAF have been associated with familial melanoma. In the future, families might be screened so as to identify those members who are carrying a defective gene. Moles in people belonging to melanoma- prone families are subject to change at certain times of life. They may get larger or show alterations in color or elevation, so for those periods, they are described as being active. While the reasons for these changes are not fully known, there could be a hormonal component: Moles are more active at puberty and during pregnancy. Many—but not all—physicians advise high-risk individuals not to take hormonal medications, such as oral contraceptives or hormone replacement therapy. Individuals with the Atypical Mole Syndrome can improve their chances of early detection by increasing the frequency of skin self-examination and by visiting a physician more often. The clinician may take photographs to document whether there are new moles or changes in older ones. Children in melanoma-prone families need special care, because familial melanoma is likely to make its appearance early in life. Even though these cancers usually do not appear until after adolescence, they may arise in much younger children who have a family history of melanoma. Most physicians, therefore, advise parents to make a point of studying a child’s skin frequently from infancy on. Physician examination should start at the age of ten and continue on a twice-a-year basis thereafter. Particular care should be taken at puberty and during adolescence when hormonal changes activate the moles. Here is some encouraging news: Because melanoma families are on the lookout for the disease and seek professional consultation early, the survival rate for familial melanoma is even higher than that for non-familial melanomas. Clothes can protect your skin against the sun’s harmful ultraviolet (UV) rays. But not all clothing is created equal. How the clothes are made, the dyes used and whether or not the material is treated with additives all affect the amount of protection they provide. As a rule, light-colored, lightweight and loosely-woven fabrics do not offer much protection from the sun. That white T-shirt you slip on at the beach when you feel your skin burning provides only moderate protection from sunburn, with an average sun protection factor (SPF) of 7. At the other end of the spectrum, a long-sleeved dark denim shirt offers an estimated SPF of 1,700—which amounts to a complete sun block. In general, clothing made of tightly-woven fabric best protects skin from the sun. The easiest way to test if a fabric can protect your skin is to hold it up to the light. If you can see through it, then UV radiation can penetrate it – and your skin. The color of the fabric also plays a role. Darker-colored fabrics are more effective than lighter at blocking out the sun. For instance, the SPF of a green cotton T-shirt is 10 versus 7 for white cotton, and a thicker fabric such as velvet in black, blue or dark green has an approximate SPF of 50. Even if the piece of clothing has a good SPF, what you do while wearing it can make a difference. If the fabric gets stretched, it will lose some of its protective ability, because the fabric becomes thinner and more transparent to light. And once it gets wet, it can lose up to 50 percent of its SPF. In Florida, it is a common practice for parents to put a white T-shirt on their children to protect them from the sun while swimming. But when that T-shirt gets wet, it provides an SPF of only 3. 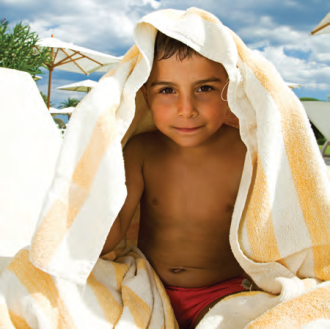 When selecting clothes for sun protection, consider fabrics that have been specially treated with UV absorbers. Many companies offer high Ultraviolet Protection Factor (UPF) clothing which incorporates colorless compounds to shield those parts of the body most likely to be overexposed to the sun. It is important to understand the labeling information on sun-protective clothing. New standards for sun-protective fabrics in the US were unveiled in January, 2001. UPF is similar to SPF, in that they both measure sunburn protection. But UPF ratings measure how much of both ultraviolet B (UVB) and ultraviolet A (UVA) radiation is blocked, whereas SPF is a measurement of UVB protection only. This can be critical for people who have had skin cancer or are undergoing radiation or chemotherapy. The UPF rating indicates how much of the sun’s UV radiation is absorbed. A fabric with a rating of 50 will allow only 1/50th of the sun’s UV rays to pass through. This means the fabric will reduce your skin’s UV radiation exposure significantly, because only 2 percent of the UV rays will get through. 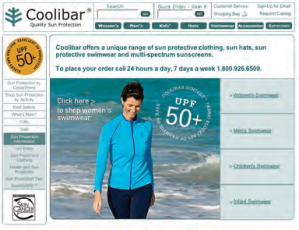 Only clothes with a UPF of 15-50+ may be labeled as sun-protective. Also, like regular clothing, sun-protective clothing may lose its effectiveness if pulled too tight or stretched out, if it becomes damp or wet, or if it is washed and worn repeatedly. Laundry additives can substantially increase a fabric’s SPF. When washing your clothes, add specialized laundry detergents that contain sun-protective ingredients. The treated fabric will remain UV-protective for approximately 20 washings. Sun exposure damages the eyes as well as the skin. Even 1 day in the sun can result in a burned cornea (the outermost, clear membrane layer of the eye). Cumulative exposure can lead to cataracts later in life (clouding of the eye lens, which results in blindness). The best way to protect eyes is to wear sunglasses. Not all sunglasses provide the same level of ultraviolet protection; darkened plastic or glass lenses without special UV filters just trick the eyes into a false sense of safety. Purchase sunglasses with labels ensuring that they provide 100% UV protection. During heat illness, the body’s cooling system shuts down. Body temperature goes up, which inhibits the ability to sweat. Mild symptoms of heat exhaustion include thirst, fatigue, and cramps in the legs or abdomen. Left untreated, heat exhaustion can progress to heat stroke. Serious heat-related symptoms include dizziness, headaches, nausea, rapid heartbeat, vomiting, decreased alertness, and a temperature as high as 105F or more. In severe cases, the liver, kidneys, and brain may be damaged. Alcohol use also increases the risk. So do medications that slow sweat production such as antihistamines, tricyclic antidepressants, and diuretics used to treat water retention, high blood pressure, and some liver and kidney conditions. People ages 65 and older and young children are especially vulnerable to heat illness. What you can do: Air conditioning is the No. 1 protective factor against heat illness. Reduce strenuous activities or do them during early mornings and evenings when it’s cooler. If you’re outside for long stretches of time, carry a water bottle, drink fluids regularly, and don’t push your limits. People who play sports should wear light, loose-fitting clothes and drink water or sports drinks before, during, and after activity. If you see someone experiencing heat illness, have the person lie down in a cool place and elevate the legs. Use water, wet towels, and fanning to help cool the person down until emergency help comes. Now, go have fun. And be careful out there.